Early surveys for the Canadian Pacific Railway looking for a way through the Rocky Mountains, had initially recommended a northern route through Yellowhead Pass (which was later adopted by both the Canadian Northern and Grand Trunk Pacific). An alternate route recommended the Howse Pass west of Rocky Mountain House to the Pacific Ocean which, if chosen, would have had the transcontinental railroad go through or very near to the present site of Red Deer. But, more due to competition threats from American railroads than anything else, the Canadian Pacific chose a southern route even thought the land was less hospitable to agriculture and the Kicking Horse Pass was more difficult. 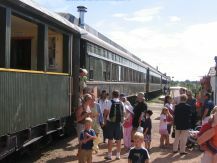 When the transcontinental Canadian Pacific Railway arrived in Calgary in 1883, the Calgary and Edmonton Trail gained major significance as the north-south stagecoach route between Calgary and Edmonton with communities and stopping houses developing along the trail at a number of locations including Poplar Grove (Innisfail), the Crossing at the Red Deer River and the Barnett ranch (Lacombe). From 1885 to 1890, a series of charters were granted to a number of companies to construct a rail line from Calgary to Edmonton but most never succeeded in getting started as a result of lack of financing. The Alberta and Athabasca Railway Company was to start in the summer of 1887 with a line from Calgary through Drumheller and north along the west side of Buffalo Lake to Edmonton (later somewhat adopted by the Grand Trunk Pacific Railway). Had this been built at that time, it may have changed the principle corridor between the two major cities and the location of several municipalities that thrive in the corridor today. But a more direct route between the two major communities was desired. A revised charter was to take the railway near the proposed Alberta Lumber Company facilities (built in 1887) near Innisfail, owned by the same principals as the railway. It was to cross the Red Deer River northwest of present-day Innisfail where a townsite was laid out near the river and was to run west of the river northward. Grading commenced in 1887 but stopped after a month due to continued financial problems. Again, it would have had a significant impact on the location of communities. Another revision put the proposed route near the mouth of the Blindman River (a few miles northeast of the current city). A new charter changed the name to the Alberta and Great Northwestern Railway. That charter was sold to a new company, the Calgary and Edmonton Railway Company, in early 1890. Once completed, the line was to be leased to the Canadian Pacific Railway for 6 years with an option to renew the lease or buy out the line. Construction started north of Calgary in 1890 but a decision was yet to be made as to where it would cross the Red Deer River. Three routes had been surveyed -- the one near Innisfail, one at Red Deer Crossing and one at the mouth of the Blindman River (17 miles downstream from the Crossing), the preferred route as it necessitated only one river bridge instead of two. The overall route was to follow the general C & E Trail corridor but the railway decided on its own route to reduce the grade of the railway or to accommodate preferred locations for communities. North of Poplar Grove (renamed Innisfail) to south Red Deer, the railway was built a couple of miles east of the C & E Trail. The settlement at the Crossing, where the historic Fort Normandeau is located, generally expected that the railway would cross the river at that settlement. In fact, a townsite had been laid out in anticipation of the railway going through there. In July of that year, James Ross, on behalf of the railway, met with Rev. Leonard Gaetz, one of the largest landowners near the river who had a great deal of political influence and was one of the principle promoters of the region in Calgary and eastern Canada. When Rev. Gaetz offered to give the railway half interest in 600 acres of land to build the townsite and railway there, Mr. Ross gladly accepted, much to the chagrin of the settlers at the Crossing. 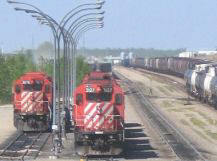 The rest, they say, is history -- see Calgary and Edmonton Railway and Calgary and Edmonton Railway near Red Deer. Once the townsite was determined, the settlers at the Crossing moved to the new community of Red Deer. When the line was completed to South Edmonton in 1891, travel between the two major cities was reduced to 12 hours from 4 days by stagecoach marking the end of the Calgary-Edmonton Trail service. The CPR lease was renewed annually after the original lease expired until 1903 when the company signed a 99 year lease. Eventually the Calgary and Edmonton Railway became a wholly-owned subsidiary of Canadian Pacific. In 1905, Canadian Pacific, as part of an extension of the Calgary-Edmonton Railway charter, built a branch line east from Lacombe to Alix that eventually was extended to Stettler, Coronation and into Saskatchewan. Another branch was built east of Wetaskiwin through Camrose. 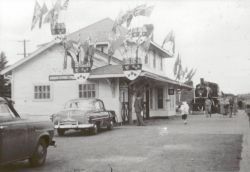 In 1908, Red Deer became the divisional point, effectively assuring the town that it would become the distribution centre of Central Alberta and a new grand station was built in 1910 at the head of Ross Street. 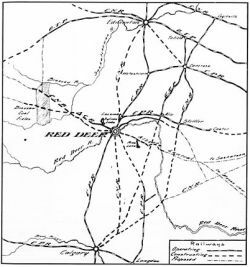 In 1911, the Red Deer based Alberta Central Railway started construction west of Red Deer toward Rocky Mountain House and was originally intended to be extended to the Brazeau coal fields and part of a major interprovincial railway. In the same year, the Alberta Midland Railway, a subsidiary of Canadian Northern Railway, opened a north-south line between Calgary and Edmonton through Drumheller, Big Valley, Stettler and Camrose. The Canadian Northern Western Railway started construction of a line originating from near Stettler extending west to just north of Red Deer. It then extended further west to Sylvan Lake on its way to the Brazeau coal fields. 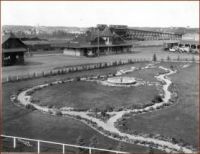 The railway had also planned to build a north-south Calgary-Edmonton line through Red Deer but construction never occurred. In 1913, a north-south Calgary-Edmonton line was built by the Grand Trunk Pacific Railway through Three Hills, Delburne, Alix, Mirror and Camrose using much of the land surveyed by the Alberta and Athabasca Railway Company. In the same year, the Lacombe and Blindman Valley Electric Railway started construction west of Lacombe but did not reach Bentley until 1917 and Rimbey in 1919. The provincial government took over the line when it went bankrupt, renamed it the Lacombe and Northwestern Railway and sold it to Canadian Pacific in 1928. The Canadian Northern Railway (and its subsidiaries the Canadian Northern Western Railway and the Alberta Midland Railway) and the Grand Trunk Pacific officially became part of Canadian National Railways between 1919 and 1923. The portion of the Brazeau subdivision of Canadian National between Rocky Mountain House and Nordegg was abandoned in 1955 when the mines closed. Around the same time, both railways were well on their way to converting from steam to diesel and passenger service was declining. In 1960, the first rail relocation in Western Canada occurred when Canadian National closed its yard and station at east downtown Red Deer and moved its operation to the north side of the Red Deer River. Also in 1960, a portion of the Alberta Central subdivision of Canadian Pacific immediately southwest of Red Deer was relocated from Forth to Tuttle to accommodate the building of the new Highway 2. In 1983, the subdivision was abandoned and, in 2009, the portion between Tuttle and Benalto, including the historic Mintlaw trestle, was sold to Red Deer County. In 1986, the Central Western Railway became western Canada's first modern day short line railroad when it took over the Stettler subdivision of Canadian National (formerly Canadian Northern/Alberta Midland) between a junction south of Camrose and Morrin. In 1992, it acquired the Coronation subdivision of Canadian Pacific. 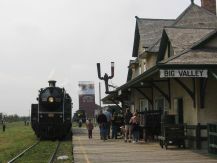 Much of the railway was later abandoned except for the portion between Stettler and Big Valley which is now used for steam train excursions by Alberta Prairie Steam Tours. 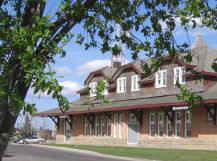 In 1990, the Canadian Pacific line and all its operations was relocated from downtown Red Deer to the northwest part of the city. Both the downtown station and river bridge were set for demolition but, due to some very dedicated citizens, both structures were saved and received historic resource designation. Lines in Central Alberta still in operation today include the CPR Calgary-Edmonton line through Olds, Innisfail, Red Deer, Lacombe, Ponoka and Wetaskiwin with about 15 trains per day, the CNR Calgary-Edmonton line through Three Hills, Delburne, Alix, Mirror and Camrose with about 4 trains per day, the CNR Brazeau subdivision from Mirror to west of Rocky Mountain House through Joffre, Red Deer north and Sylvan Lake with about 2-3 trains per day, the CPR Lacombe subdivision east of Lacombe to the Dow plant with 1 train per day, the CPR northern east-west line between Edmonton and Saskatoon through Wetaskiwin and Camrose with 2-4 trains per day.